Saddle Pads, gp and western cut. Available in a variety of colours. Makes a pleasant change from the mundane black or brown. Pads have acquired colour in recent years. 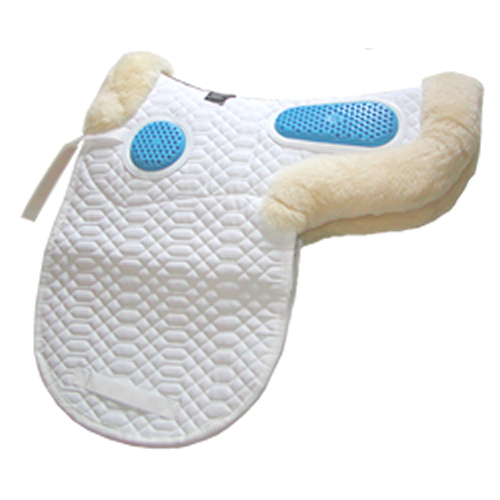 If the Equitex pad suits the saddle you can order white, red or blue. These are designed to suit the extra wide native, flat backed cob, Shetland or large hard to fit pony. Deluxe – cantle block, knee rolls. Extra deep can be added for jumping. Deluxe plus as above but with thigh rolls. I am looking for reviews and photos of these as the website mentions these being suitable for all disciplines, not just showing. From memory the Pony Club only allow their approved saddles. If I took one of these to a show would I be allowed? If I wanted one for everyday use would I create pressure points under the stirrup bar? Gel-Eze Saddle Pads; The Innovation! In 1999, scant scientific research had taken place to assess the forces applied to a horse’s back when ridden, and the benefits of saddle pads were poorly understood; yet equestrian wholesaler Stephen Biddlecombe was convinced that an innovative gel product had a place in the equestrian marketplace to help protect horses’ backs and offer shock absorption. The Gel-Eze brand began its development that year, and launched three years later after significant research. It is now exported to over 35 countries worldwide by UK-based manufacturer World Wide Tack. Technology has advanced a great deal in the last twenty years, allowing the equestrian industry to develop some outstanding products and to study the equine sports horse in greater detail.